We have been inspired over the years by our customers’ creativity, and no one was more excited about the creation of Pinterest than we were – talk about a place for new ideas! Some of our favorite ideas are about ways to make your bedroom more beautiful and unique. We have recently talked about the importance of the bedroom environment to good sleep. Today we are going to talk about a couple of smart, fairly cheap ways to make your bedroom more dramatic, and uniquely yours, using bed draperies. 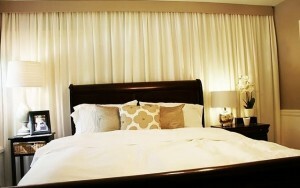 Say you want a dramatic look to your bed but can’t afford to buy an expensive headboard – why not create your own? 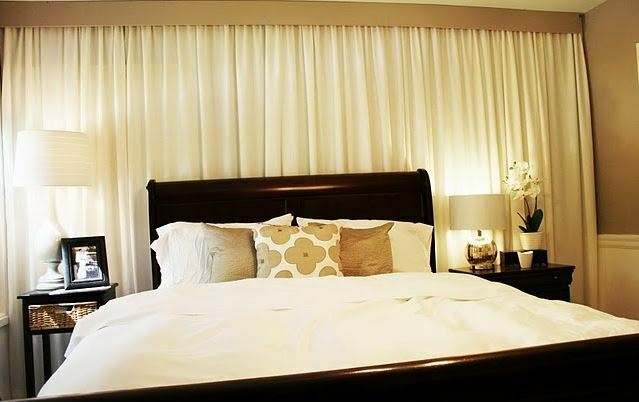 Many creative customers have installed a curtain track behind their bed and hung a decorative curtain or sheer panel to create the look of a unique headboard. We’ve even seen string lights hung from a curtain track for a beautiful illuminated look. This can be accomplished using our 5400 Curtain-Mate wall-mounted curtain track, which would be flush with the wall, and our 3091 Snap Tape, which would allow you to cover the drapery hardware with the curtain panel, making the whole installation practically invisible. Another decorative idea we love, especially for kids’ rooms, is to put bed draperies all the way around the bed. Hanging a sheer panel can give an exotic, romantic, African-safari look to an adult’s bedroom, or a fairy-tale princess look to a little girl’s bedroom. Or, use an opaque panel to create a private hideout/fort in a child’s bedroom. Our best track for this application is our 6100 Flexible Curtain Track, which can be bent by hand without compromising strength, and installed into the ceiling. If that sounds like too much work, you can also splice together four of our 88001 Privacy Cubicle Curtain Track with premade 90 degree bends. Both options are suitable for ethereal sheers or heavy draperies, and will allow you easily and smoothly open and close the curtain panels as needed.